If you’re about to get married (or recently did) you have probably googled ‘wedding invitations’ and got lost in a sea of overwhelming, badly designed wedding invitation sites. 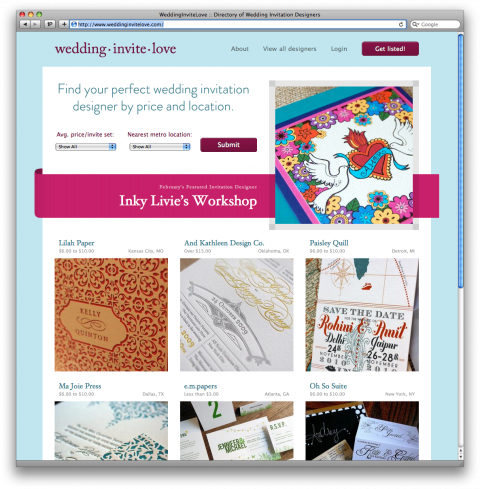 Well, there is help: WeddingInviteLove.com is a brand-new wedding invitation directory by lovely Tracy Osborn. If you’re a wedding invitation designer, you should register on her site asap. It’s a wonderful resource for the soon-to-be-married-folks in us. As a recently engaged girl who is very particular about her papergoods, I am super excited to see this site. Thanks for sharing it! Thank you thank you!!! We will get married soon, so I needed to start the work at our invitations. Now I have no reason to not do so! Love this blog, everyday something new / interesting and engaging! Keep it up!